Can't get enough of the deliciously disturbing cat-and-mouse game between MI6 operative Eve (Sandra Oh) and psychopath assassin Villanelle (Jodie Comer) in Killing Eve? Well, we have good news: the day after season two's premiere on April 7, AMC has already renewed the spy drama for a third season! 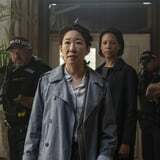 "We love having this show and the brilliant Sandra Oh, Jodie Comer and Fiona Shaw on our networks," Sarah Barnett, president of entertainment networks for AMC Networks, said in a statement about the exciting news. "Phoebe Waller-Bridge and Emerald Fennell have delivered two addictively entertaining seasons. As we did last year, we're renewing Killing Eve right out of the gate, now with Suzanne Heathcote as lead writer, as a sign of confidence – we adore this show as much as our fans do. Killing Eve doesn't do anything in a templated way; we love giving opportunity to three genius women to make their mark." Season three will see the return of the core cast, but there's going to be a new twist - British writer Suzanne Heathcote is taking over as showrunner from Emerald Fennell, who previously took over for creator Phoebe Waller-Bridge. It's pretty cool how the series passes the baton to a new female writer every season, no? "It's been such an exciting year for me on Killing Eve," Fennell explained. "I think it's cool that this tradition has been built into this untraditional show. Inheriting some of Phoebe's characters was a treat – I can't wait to see what Suzanne does next." Waller-Bridge also celebrated Heathcote's new position by noting that "we can sleep soundly knowing these characters are safe in [her] hilariously murderous hands."